I’ve been a huge fan of Baked ever since I picked up their cookbook [Baked: New Frontiers in Baking] last year while perusing the clearance rack at Urban Outfitters. I usually don’t purchase cookbooks on a whim, and certainly not at Urban Outfitters, but the good vibes emanating from the pages couldn’t be denied—the recipes were out of the ordinary, the photos were beauteous, and the approach was refreshingly hip. On our final morning in New York, The Astronomer and I boarded the F train to pay my favorite Red Hook bakery a visit. It’s admittedly nuts to travel to another borough for dessert, especially considering the zillion and one wonderful bakeries nearby in Manhattan, but hey, that’s what vacations are for. 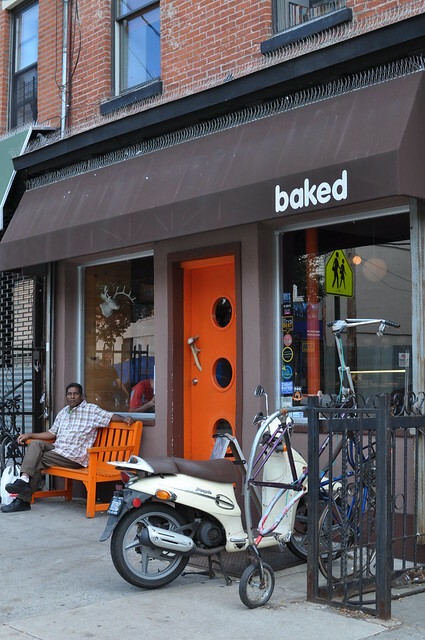 Matt Lewis and Renato Poliafito opened Baked in 2005 after leaving their day jobs in advertising. 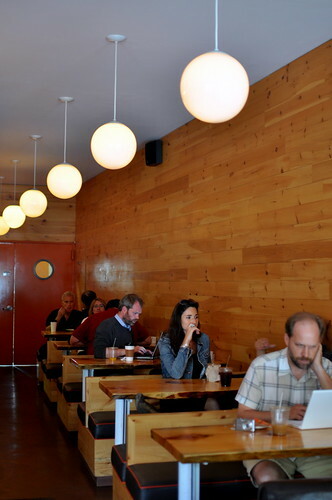 The Brooklyn bakery’s interior is modern, yet cozy, and resembled a hunting lodge as imagined by city folks. After perusing the selection of bars, cupcakes, and breads on hand, I ordered a slice of Sweet and Salty cake. I’ve been eyeing the recipe for this cake since day one, but never found a good excuse to make the triple-layered behemoth. The swirls of frosting were mesmerizing. The cake was comprised of a dark chocolate cake frosted with a caramel chocolate ganache and topped with fleur de sel. The cake was pleasantly moist, while the frosting had a buttery quality to it. Unfortunately, the overall flavor was exceedingly chocolaty and as a result, far more sweet than salty. Now that I’ve tasted the Sweet and Salty at Baked, I can tweak the recipe at home to make it just to my liking. 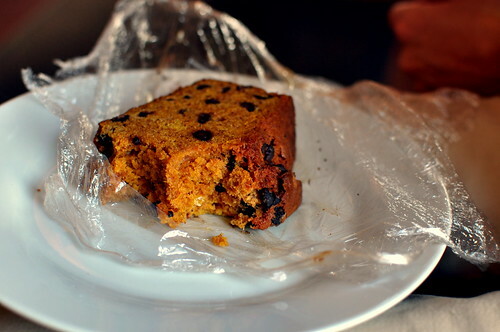 The Astronomer ordered a slice of pumpkin chocolate chip bread, which was a solid effort and super-chocolaty. Clearly, Brooklyn hearts cacao (and water towers). 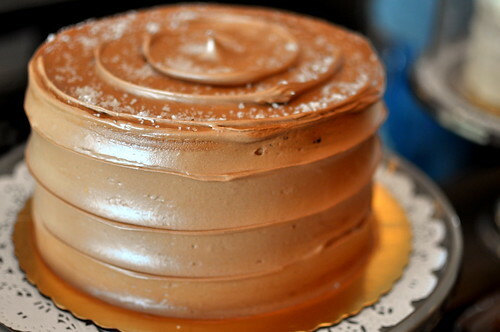 I love the frosting on the cake… makes me want to dive in! I’m waiting for the recipe. 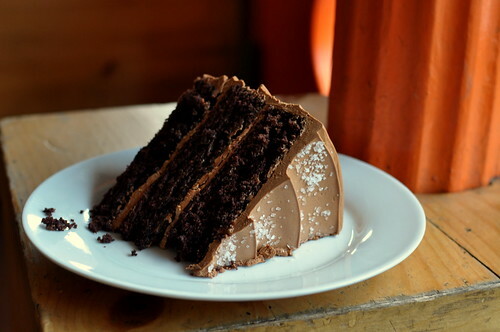 i have to find this recipe for chocolate ovaltine cupcakes with chocolate ganache and sea salt frosting…. it was the most perfect cupcake i’ve ever had. i’ll see if i can track it down. Wow, if it’s too salty for you, I imagine I’d be on my back, w/ legs curled up like a bug, shivering. Gorgeous cake though and fun decor!